If you&apos;re into puzzle games, you should make it a point to check out the creative and compelling Gorogoa, which we previewed last week. There&apos;s a whole world out there, however, of similarly excellent games that deserve to be lauded for their world-building, puzzles and atmospheric design. If you liked what you saw with Gorogoa, check these games out and see if they resonate with you. Chances are at least a few of them will. 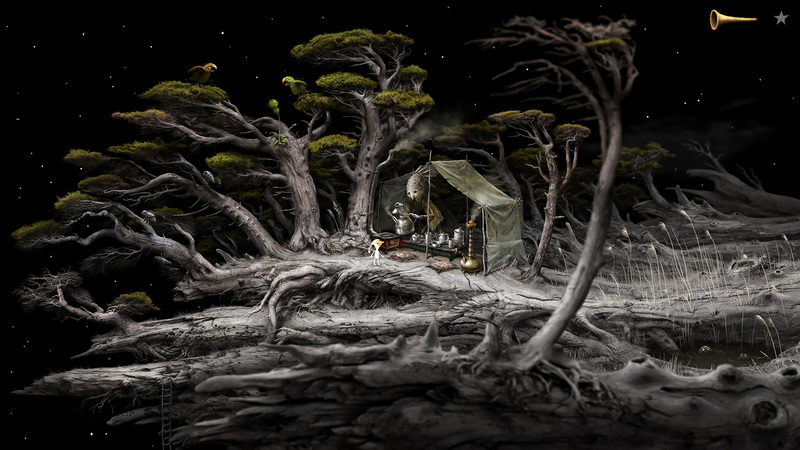 Samorost centers around the adventures of a small human traveling through bizarre environments. While there is no spoken dialogue, the puzzles make up a discernible narrative. The puzzles are certainly fun, but the real draw to Samorost is the odd, surrealistic settings. The game features a combination of real-world items and locations — sometimes blown up or shrunk to ridiculous proportions — and the imaginary beasts and characters you meet along the way. This game also breaks with point-and-click tradition by ditching the usual inventory system. Samorost doesn&apos;t offer a particularly difficult challenge, but those who want brain teasers in an imaginative original world will love it. Samorost 1 can be played free via Amanita Design&apos;s website, and you can play a demo of Samorost 2 there as well. Samorost 3 can be found on Steam for $19.99. In contrast to Samorost, The Room series is completely puzzle-centric. In fact, the puzzles are the environment. There are puzzle boxes, multi-room puzzles and more to solve in this 3D puzzle series. The plot of The Room series centers around the Null element, a fictional material used to build many of the game&apos;s puzzles. The player must complete the puzzles in an attempt to escape the Null dimension which has trapped them, while learning about others who tried to escape but couldn&apos;t.
The Room is ideal for those who want more brain-bending puzzles than your typical adventure game. It offers some of the most creative puzzles I&apos;ve seen, and the dark tone lends an aspect of horror to the gameplay. You can purchase all three entries of The Room series on Android, iOS, or Steam. Machinarium was created by Amanita Design, the same studio that created Samarost. Like Samarost, Machinarium has no dialogue, but the environments and character designs are slightly more rooted and less surrealist this time around. Players take control of a small robot named Josef as he&apos;s dumped on a scrap heap. Josef tries to reenter the robot city, but runs into constant adversity. The player must also solve puzzles to aid the city&apos;s citizenry and solve the mystery of Josef&apos;s origins. Since its 2009 release, it&apos;s been ported to almost every major platform. You can play it on Windows, OS X, Linux, PlayStation 3, PlayStation Vita, iPad, Android, and Windows Phone. There is also a short demo of Machinarium on the game&apos;s official webpage, so give it a try. When you ask gamers what the most influential PC puzzle game is, most will likely say Myst. The combination of first-person view and still images was a technical marvel for its time, and still looks great today. At the beginning of Myst, you&apos;re given very little story and pushed to solve logic puzzles throughout several "Ages" linked to a central hub via books. Myst is a must-play for puzzle lovers, and, luckily, it&apos;s available on a ton of different platforms. If you&apos;ve got a Mac, PC or Linux-based computer, a Sega Saturn, a PlayStation, a 3DO, an Atari Jaguar CD, a Philips CD-i, an Amiga, a PSP, a Nintendo DS, a 3DS or an iOS or Android-powered device, you can experience Myst. However, if you want to get the most of your adventure in Myst, you&apos;ll want to check out the Unity remake, realMyst: Masterpiece Edition 2.0 which is available on Steam. Hand-drawn graphics in video games is a beautiful trend that we don&apos;t see often enough. Thankfully, The Whispered World makes great use of this style. In this game, you play as Sadwick the clown as he attempts to save the world from destruction. The setting of The Whispered World is a land where reality and dreams are intertwined. So expect things to get weird. There are few point-and-click adventures as visually stunning as The Whispered World, and it gets the hand-drawn animations right in a way that few games have before — or since. A sequel titled Silence launched at the end of last year. It lacks the hand-drawn sprites of the original title, but it&apos;s still visually compelling and worth your time if you enjoyed its predecessor. Both The Whispering World and Silence are available on Steam.